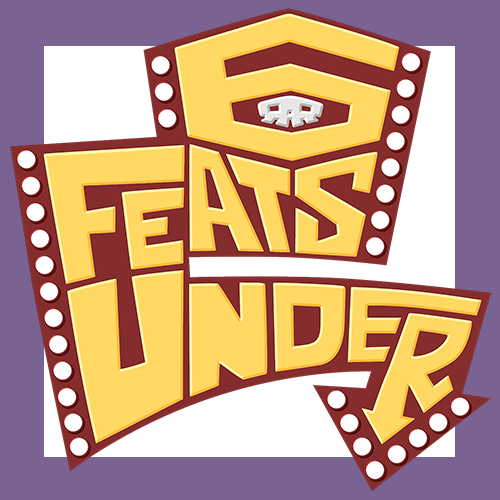 Six Feats Under is an actual play podcast focused on exploring a variety of tabletop games and sharing them with the world. With tabletop tomfoolery and wizardly wisecracks, we bring you actual play of lesser-known tabletop games. Basically, this means we play a bunch of games and have a real swell time doing it. New to Six Feats Under, or checking in again after a while? No worries. Here’s our latest three episodes to keep you company. With the pirates finally cleared out, the blue patrol returns to their original task: decoding the Spear's message, and finding anything they can about the Spear. Who they are, what they want, and most importantly of all - why a spear? Francisca is played by Riley. Lily is played by Eliza. Tander is played by Drakkel. Zeke is played by Devious Vacuum. Our Games Mouse is Grant. Today's episode was edited by Riley. The fellowship is finally entirely reunited, as Rue and Pan ride Char into town, Poptart swims back home from outer space, and Yuria is there to greet them all. But she's not the only one - Char was sealed up in that sword for a reason, and the columnists have rounded up a posse to seal Char away once more. Support the second edition of Fellowship on kickstarter now! Friar Pan is played by Clove. Rue Titania is played by Ikks. Poptart is played by Joey. Yuria is played by Riley. The introduction was an excerpt from Cassandra by Sophie Ellis-Bextor, and was voiced by Grant. The music in this episode was performed by Thylacinus. This episode was edited by Gnome. Aurelia (Clove), Boggurt (Gharbad), Coda (Riley), Solis (Aubrey), and Verse (Violet) have been wildly separated from one another, each discovering pieces of the story of why the Guardian has awoken once more. Only by coming together again can they hope to shut it down, once and for all. Now the Inverse World is here in the Fellowship system. Support the book on kickstarter now! Long-running series with an ongoing plot, recurring cast of characters and players, and (usually) high stakes. Two patrols of mice venture forth to guard the territories. They are the Mouse Guard, heroes in name and deed. Were it not for the guard, mouse society could never exist. Under our brave paws, we will keep every mouse safe, from all manner of harm. No matter what. Hail all those who are able. Any mouse can, any mouse will, but the Guard will prevail. A lonesome dragon, figuring out who they are and why they even exist. A playful guardian, exploring a world they do not understand. A mysterious wizard, who cares more than they want anyone else to know. An outcast engineer, trying to find something, anything to believe in anymore. Do you remember 2007, dear listeners? Because oh boy we sure do. Biff Wilcox here, and it's my pleasure to welcome you to another amazing night of WORLD WIDE WRESTLING! and settle it all in the middle of the squared circle. Benedict Bell is a school for the elite. The ruthless. The... bloodthirsty. One winter, the usual remedials teacher is replaced. Things just get worse from there, as old grudges and new romances burn dangerously akin. Welcome to Six Feats Under’s debut campaign! This is one of the oldest actual play campaigns out there, from way back in 2012. It’s so old, it began back when 13th Age was still in development! From hellhole to moon, we're looking forward to having you along for the ride. Before there were Feats, there were technical difficulties. The 2009 LP that started it all, edited and compiled by Riley! Self-contained episodes with no additional information required. Look, let me make this easy for you: in this game, you play as a special type of bounty hunter called a LASER. English, algebra, gym, lunch, cryptozoology, dead physics. Just another day at Occultar Academy! Mischief and meddling with fairies, in costumes, on adventures! Action/Adventure Roleplaying in the World of Tomorrow! The "eclipse phase" is the period when the cell does not yet appear to be infected by a virus, but it is. First, you have a plan. Then, things go wrong. Finally, things go worse. Gamble it all to make tomorrow yours. So ante up - its time to place your Final Bid. Oh, goblins. Is there anything they can do? Tiny towns and miniature monsters have problems too, you know! The Inverse World is a bizarre place. There is so much to see, and all of it is just out of reach. Welcome back to the Inverse World, a strange place with a golden god trapped in the center of the world, rain that falls up from the center, floating islands throughout the empty space above, and a ceiling of stone, covering the top of the world. Bonus Feat 9 and Bonus Feat 23. Nothing ever goes smoothly for the crew of the Raptor. They boldly go where many have gone before, and try to do better. Monstrous creatures with writhing limbs and gnashing teeth-- and that's just our armor! The newest Spaghetti Western movie, filmed and directed by you and your friends! What will you gamble to get what you need? Stories of love and loss in the real-life 588th Night Bomber regiment that terrorized the Nazis. Fast cars, explosions, fight scenes. Don't worry about why, just watch how cool. With an engine as versatile as this, it's hardly surprising our cast includes a talking dog and a sentient exploding spacesuit! The Spire is all the world you've ever known.